I felt stuck in time reading my course outline for Temporality Consciousness and Everyday Life and found myself caught in a circular loop moving unstoppably forward, propelled by the evasiveness of time when attempting to identify, what is the problem of time? I speak of this problem as a problem for cosmologists and as an anthropological object of study. This essay will put both of these academic fields in a dialogue tracing the trajectory of anthropological thought beginning in the nineteenth century and Western science’s evolving conception of cosmology in three generalized steps. I do not intend to claim that these analytical shifts are analogous or chronologically paired, but parallel reflections of the positioning of subject or observer within the universe. Providing three stages of science’s understanding of space-time is the theoretical physicist Lee Smolin. Smolin has extensively written about quantum cosmology theory and dedicated much of this work to the problems with time. 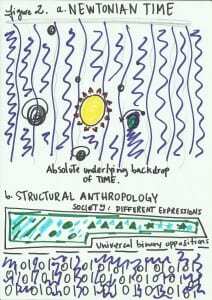 I will employ Smolin’s three-tiered model to track a condensed evolution of anthropology and scientific cosmology. The conclusion of this journey will result in a re-positioning of the observer/actor of time as part and whole of the universe. Thus, time is hence described as a network of relations between temporal reference points of which subject/actors are encompassed by and participating with. To deliver a materialization of the network I will examine the ethnographic example of a Melanesian framework of time, that Eric Hirsch and Daniele Moretti call, “Universal Past” in their article One Past Many Pasts, Varieties of Historical Holism in Melanesia and the West. Universal Past connotes an image of an expanding temporality in the employment of the Fuyuge Tribe’s creative force of Tibide, “of the past but also adheres the present” and functions as an example of time as a whole and part of the individual (Hirsch and Moretti 2010: 285). To conclude, I will return to the problem of time for anthropology. Nancy Munn in her essay, The Cultural Anthropology of Time: A Critical Essay, makes clear the bound up problematic relationship of time and general theories of anthropology (Munn 1992: 93). I will highlight her plea for a more comprehensive understanding of time and elucidate this in faults she claims. The field of anthropology in the nineteenth century identified itself as a scientific authority that was capable of finding and delivering truths about humans (Holbraad 2012: 21). Beginning with a reflexive evolutionary anthropology claiming a “highly distinctive sociocultural manifestation that was characteristic of the ‘advanced’ societies.” (ibid 21). This platform of a colonial hierarchical social structure, placed the anthropologists in a position of authoritative knowledge, based on this more ‘advanced’ position in society, ‘advanced’ relative to the primitive society in question. Anthropologists were put on a pedestal above the natural/cultural worlds of their informants, as they believed to possess an advantaged knowledge of truth. The more ‘advanced’ the society on a progressive evolutionary model determined by the anthropologist, the closer one was to truth-claims, (ibid 22). Moving into the twentieth century signified a shift from naturalist evolutionary anthropology to the school of structural functionalism. Structural functionalism formulated a top down approach that saw social structures functioning to maintain the whole, the whole symbolic of society. This maintenance of shared values and norms constituted a social space of reality above biological forms, a privileged space of social constructed phenomena. As previously stated in the introduction, I am not attempting to track parallel chronological trajectories between science and anthropology, but rather mirror how our scientific perceptions of time follow similar evolutionary patterns to anthropological understandings of society, specifically the placement of subject/actor. The Aristotelian Revolution began in 350 BC with Aristotle and culminated with Ptolemy in 150 AD (Smolin 2005). The ancient Greek understanding of space-time grew out of a hierarchical universe and a steady, finite Aristotelian cosmology. An Aristotelian cosmology conceived of concentric, celestial rotating spheres, placing earth at the centre equidistant and surrounded by the heavens. 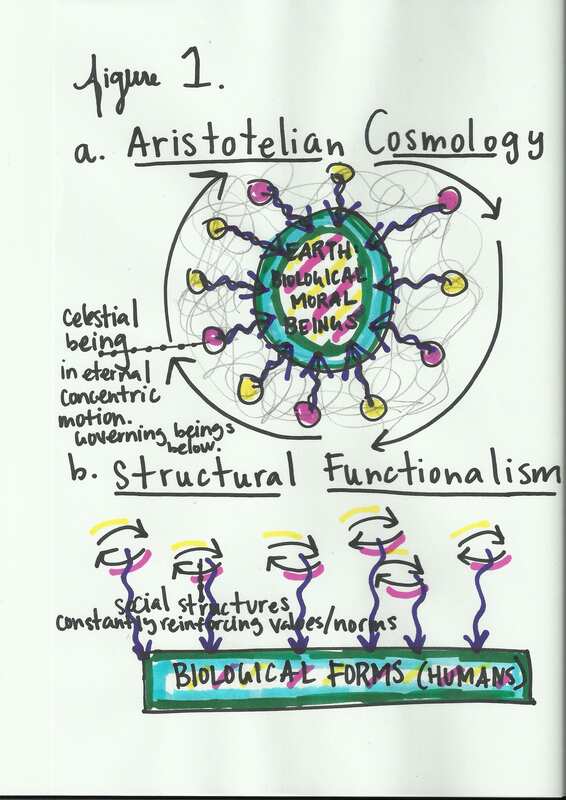 In Figure 1 I have depicted visually the similarities to the meta-social space established in structural functionalist anthropology and the essential, eternal Aristotelian celestial sphere acting and influencing outside the earth, making changes ‘below’. The Aristotelian cosmology governed by a structured hierarchy belonging to a moral code of celestial spheres, the closer an earthly being was to heaven the closer they were to transparent truth (Smolin 2005). Anthropological theories of structural functionalism also valued absolutes preserving social structures as building blocks of society. What I would like to illuminate in both instances is the failure of accommodating or being able to account for social change. As both eternal absolute governing structures lack the flexibility of change, not taking a strong account of cognitive actors. I would propose this is a result of the position of the subject/actor outside or below the regulating forces. With the introduction of Newtonian physics a more liberal universe was built on the supposition of an absolute, infinite, eternal time. Historically, the Newtonian revolution is measured as starting with Copernicus in 1542 until Newton in 1687 (Smolin 2005). Newtonian physics recognized and put primary time’s functional properties. However, different to Aristotelian cosmology, these laws had less religious implications. A universal time was named and the earth was no longer centrally and symmetrically located in celestial heavens. Newtonian physics was opened up by a burgeoning globalized world that was becoming self-aware and developing a locus for the earth in relation to the universe. Time was an absolute progression against which all change was measured, a background that defined where things are and how they move, a perpetual motion of bodies in a mechanical system subject to Newtonian laws (Smolin 2005). Reversible and Irreversible time were laws of two corresponding categories that dictated motion and time. Realized in a time continuum that theoretically is a process that can (or could) proceed equally well either in the forward or the reverse temporal directions. To an anthropologist, this might start to resemble two binary oppositions; from which the theory of time is grounded. Structural anthropology was a theory led by Claude Lévi-Strauss, who introduced binary codes as a fundamental structure of the human mind. Structural anthropology was committed to the idea every subject could be understood universally in terms of binary oppositions. Departing from structural functionalism that was seeking out structures in the social systems themselves, structural anthropology sought to examine the cognitive effect on social structure, resulting in a bottom up approach. These binaries were a system of differences that create a code, the code allowing for different possibilities of expression. Allowing one to look at the underlying structure that provided the coordinates. The connection I wish to draw between Newtonian physics and structural anthropology is the actor’s position universally (Figure 2). Scientifically, we have Newton’s liberal universe of equal atoms and actors functioning against an absolute backdrop of time. Anthropologically speaking, structural thought classifies subjects in universal codes of binary opposition. Over one hundred years on from Einstein’s theory of relativity time-space is still considered to be a relational and pluralist universe. There is no absolute meaning to time, only relative positioning, time as a measuring of relationships of events (Smolin 2005). But, the relativity revolution has not ended, nor time, something we have come to fully understand. Lee Smolin has proposed the problem with time in quantum cosmology theories is not with time, but with assumptions that led to the conclusion there is a problem. 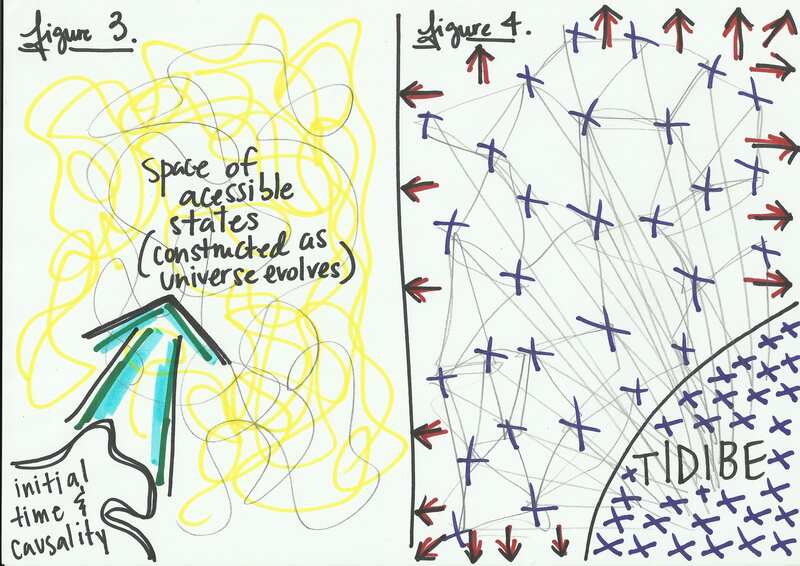 Smolin argues that the state of accessible space that is constructed as the universe evolves, is expanding out from an initial state where time and causality are built in at the fundamental level (Smolin and Kauffman 1997: 5). Please refer to Figure 3 for a visual interpretation. Traditionally, in the quantum theory of cosmology it is required to have a “non-constructable procedure to define its formal setting” (Smolin and Kauffman 1997: 2), meaning a function that sets up the universe outside of the universe – outside of the physicist. In simplified terms: by imaging the non-constructive procedure as a meta-space outside the physicist’s reach that sets the stage with what scientifically/mathematically we are working with. Time is employed as one of these functions, resulting in the disappearance of time in quantum theories of cosmology (ibid 3). Classically, these configurations of space – a system assumed to be a subsystem of the universe – start to sound like an echo of the Aristotelian revolution. But, try to imagine if as if there is clock outside the system (space), carried by an observer. Now imagine if we did not have this observer and the external clock, time would not exist or would disappear. Time is in fact represented in the description, but it is not in any sense a time that is associated with the system itself (subsystem of the universe). Instead, the t in ordinary classical mechanics refers to a clock carried by an inertial observer, which is not part of the dynamical system being modelled…instead the problem is postponed, as what is represented is time as marked by a clock that exists outside f the physical system which is modelled by the trajectories in the configuration space C.
(Smolin and Kauffman 1997: 3). The key message I want to extract from Smolin’s discussion is the call to repositioning the observer of time, time as part of the universe. Upon reading Smolin’s article I immediately time traveled to Martin Holbraad’s book, Truth in Motion, in which Holbraad makes a call for recursive anthropology. Recursive, understood as the function being defined is applied within its own definition. More specifically, in an anthropological discourse, recursive anthropology identifies a problem of anthropology that is not of the anthropologist, but the conventions of distinction in anthropology. For example, between nature and culture. To solve the problem Holbraad suggests to ‘”pursue an ‘internal’ anthropological critique of that distinction in order to reframe the question…” (Holbraad 2012: 34). In the act of recursivity it is asked that assumptions deteriorate and a re-identification of the anthropologists ensues. Anthropologists are put back into the network. In other words, to have the subject/observer recognized as part of the society/universe. In this relational view the observer can be expressed as follows, “any observer may carry any clock, no principle why we should have the same time…”, it is about relationships we are having in and with the network (Smolin: 2005). When discussing this observer of the universe as in and a part of the universe she/he is labeled a ‘partial observer’. Partial, because the observer’s information concerns a part of the universe excluding them and because the observer must interact with it (Smolin 2005). What is excluded in the universe from the partial observer is what cannot be seen. 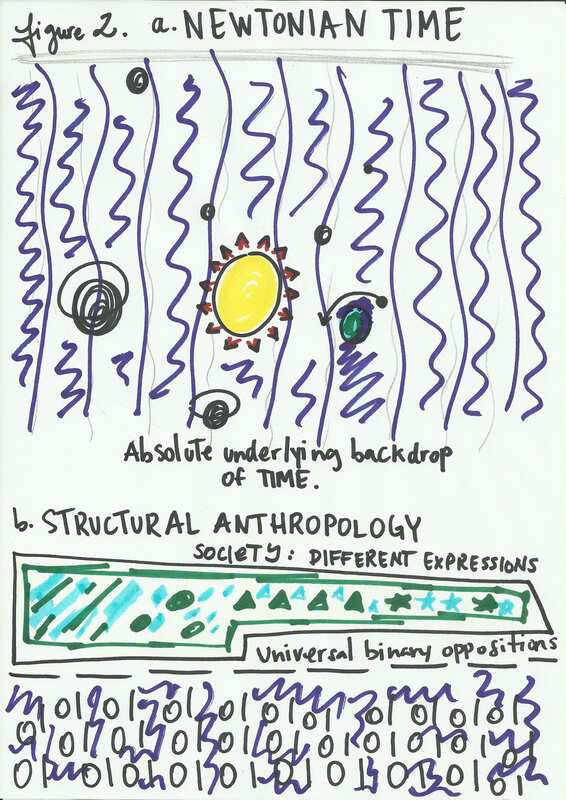 Coming back to recursive anthropology and to grasp this concept I correlate it to Marilyn Strathern’s notion of partial connections. The main point being, that the world is always both a container and what is the container (Strathern 2005). Therefore, we cannot see it all at once. Now that we have come to a point in space-time described as temporal relations, I would like to draw upon an ethnographic example from the article One Past and Many Pasts, written by Eric Hirsch and and Daniele Moretti, implementing their model of a Melanesian Universal Past, specifically The Fuyuge tribe of the Udabe Valley. Hirsch and Moretti’s analysis of Universal Past relies not on individual stories or pasts against a backdrop of time, but are formed through a network of connections and reconnections. The following section will materialize quantum physics’ theory of time as relative positioning, a measure of relationships, in the context of a Melanesian Universal Past. The actors of Melanesian Universal Past are partial observers, made up of partial connections in a Stratherean sense. In the article, Hirsch and Moretti categorize the actors in Wagner’s term of a ‘fractal person’ to establish this – “the person as an image composed of, and enchained with, other persons… (Hirsch and Moretti 2010: 285). The fractal person is compared with Tidibe, a creative force that is not only of the past, but also inheres in the preset. Tidibe is an original unity or whole from which all is differentiated (Hirsch and Moretti 2010: 285). It is concurrently one and many: one past and many pasts. In the Fuyuge, Tidibe contains you and defines you, at once a whole and part of (Hirsch and Moretti 2010: 286). The connective network of Tidibe functions within a network of multiple narratives, growing exponentially through ‘associated transformations’ the network of past and future connections are made, re-made and develop outwards as a constructed whole. As connections are forged, or in the Melanesian sense, connections reconnected, the Tibide force evolves and expands. In Figure 3/4 I have poached the model of Smolin’s theory of time and causality as fundamental state, of which a state of accessible space is constructed through evolution. This has been drawn alongside a visual interpretation the Melanesian foundational force of Tibide; the figure-ground holistic approach or origin of temporal networks of increasing complexity of relationships. Upon immersing myself in both visual fields I came to the bold conclusion that what Hirsch and Moretti describe as Universal Past, I would call Melanesian Entropy. Entropy as defined in the field of cosmology as a constantly increasing universe, energy can never decrease nor increase, where irreversibility is impossible (Smolin 2005). Hirsch and Moretti’s Melanesian Universal Past is entropic in that Tibide’s system of reconnections has been created and remains constant and only re-imagined, just as the universe’s energy cannot be created or destroyed but only altered through distribution (Smolin 2005). Universal Past turns away from individuality and focuses on a network of multiplicity, sustained by the expanding number of particular accounts that are continually produced to create a whole. 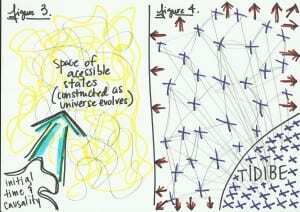 Tibide is everything the Fuyuge know, where they inhabit, and all possibilities beyond perceptual boundaries, comparable to the reality of the infinite possibilities of accessible space of the universe (Hirsch and Moretti 2010: 285). In focusing on these relationships, it is not my intention to try and fit a Melanesian concept within Western science, nor claiming universal understandings of time as complex and expanding networks. I simply want to demonstrate another rendering of time as temporal events and persons all connected through a relative network and how the position of the partial observer or fractural person is not only made up of the network but contained by it as well. …cultural time consists of fixed concepts of time that may or may not, in the author’s view, adequately represent the temporal process excluded from them. In short, cultural time is not itself viewed as temporal. These frameworks are not merely simplified; at the minimum, they cannot take account of the problem that people are ‘in’ cultural time, not just conceiving it or perceiving it. The key word is excluded. Space and time are integral to each other. When we are in time, we are in space, not outside of it. It is not one or the other but “Other Self”, recalling the Melanesian fractal person. Munn’s writing asks to give truth-value to any cultural time, marking a recursive revision. Holbraad states that ‘the ability to uphold a claim to truth” is essential to recursive anthropology by ‘transgressing representationalist assumptions so to arrive at a different concept of truth altogether” (Holbraad 2012: 53). In Munn’s case this would translate to a different concept of time. The beginning of this essay began with a question I have not, nor attempted to answer. My cyclical loop of investigation is still moving directionally forward along a time-causality continuum. Despite this, my goal of following the evolution of thought between Western science’s cosmology theories and schools of anthropological thought was to unravel a possible associative evolution with how as humans we have come to position ourselves in the universe, and how as humans we have come to place ourselves in the world. These positions and places exist spatially and temporally situate us, as subjects/actors within and a part of time. Time is not only experienced immediately but infinitely, a becoming through networks being in time as relations from and between themselves and temporal reference points (Munn 1992: 104). Anthropology is in a unique position to understand cultural time in a temporal sense; respecting that time is not perceived, rather subjects/actors are in the network, not outside, above or removed from exponentially growing temporal relations. Gell, Alfred. The Anthropology of Time . Ann Arbour, Michigan : Edwards Brothers, 1992. Print. Hirsch, Eric, and Daniele Moretti. “One Past Many Pasts, Varieties of Historical Holism in Melanesia and the West.” Experiments in Holism. (2010): 280-298. Web. 21 Mar. 2013. Holbraad, Martin. Truth in Motion: The Recursive Anthropology of Cuban Divination. Chicago: University of Chicago Press, 2012. Print. Munn, Nancy. “The Cultural Anthropology of Time: A Critical Essay.” Annual Review of Anthropology. 21. (1992): 92-123. Web. 21 Mar. 2013. Smolin, Lee. “Time and Space.” Ontario, Waterloo. 2005. Address. Smolin, Lee. “The present moment in quantum cosmology: Challenges to the arguments for the elimination of time.” Time and the Instant. (2000): n. page. Web. 21 Mar. 2013. <http://arxiv.org/pdf/gr-qc/0104097.pdf>. Smolin, Lee, and Stuart Kauffman. “A possible solution to the problem of time in quantum cosmology.” Center for Gravitational Physics and Geometry. (1997): n. page. Web. 21 Mar. 2013. <http://arxiv.org/pdf/gr-qc/9703026.pdf>. Strathern, Marilyn. Partial Connections. Updated. AltaMiraPress, 2005. Print.